You have an all singing , all dancing website but no one can find you in the search engines! What's gone wrong?... What's missing?... Where are we? I need to get more traffic to my website! Choosing the correct keywords and phrases is critical to deliver target traffic to your site. Attracting target traffic to your website ensures visitors finding your site in search engines find the correct results and information on your website. Search Engines cache the information from your website to present the URL in search results - If your keywords are not relative to your website content your site will not be found. From our detailed analysis of your website and each web page, we implement the changes throughout your website to ensure all pages are accessable by search engine spiders, and that they cache the information correctly in relavance to the search phrases and keywords required. Once your website has been optimised we embed website analytics into your web page content to monitor results and performance. This way we can tweak any additional factors that can increase your success in search engines. Your website is now ready for submission to the search engines. Our experts will ensure all the major search engines are included in this submission process. Link building is vital to developing your website visibility in search results. 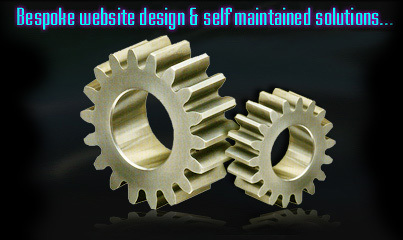 We submit your website to major directories building quality links into your website. Search Engines do take time in visiting your website to cache page content, changes made in our optimisation process will not be an overnight fix providing instant traffic and visibility. 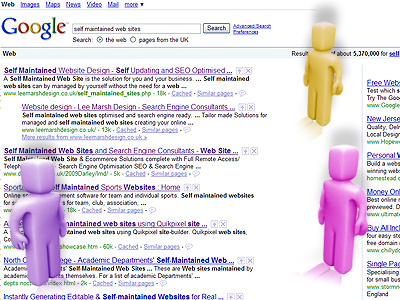 For example... A new website that is pre-optimised for search engines usually takes a week to appear in Google. We monitor our optimisation process via the embedded analytics in your web pages. You can also access these online to view your websites performance. We provide our search engine consultant and optimisation services on a monthly term basis for as long as you need or promotion is required. Contact us for your optimisation plan. The golden rule of getting high visibility in Google searches is 'Website Relevance'. Keeping this in mind as your primary target... You can be visible in search engines and searches made for your target keywords. To optimise your website we will require FTP access to your website server to implement the changes necessary to increase your website visibility. Search Engine Consultant Companys attract traffic to your web site via other methods. This can usually involve submitting your web site to hundreds of smaller search engines scattered throughout the internet to boost your link popularity. 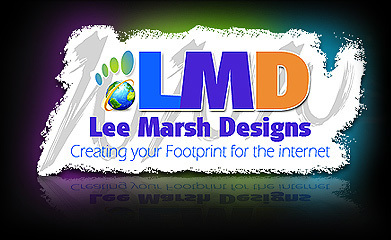 Lee Marsh Design also amend and optimise your page content and website code to strengthen the submissions. Without optimising your website content will generate untargetted traffic for a short period of time. High volume traffic is great as long as the visitors require your products and services. Your web site is like a shop on a busy high street - Everybody looks in but if you don't have what they want they will soon leave. "We can get you NUMBER 1 in Google!" With our SEO and Search Engine Optimised self maintained solutions, you can add and create new page content or FAQ's, latest news for example, relative to the keyword you need search engine visibility for. Simply add your own content. Ensure you use phrases that you require to be found for in your page title and optimisation field including your main page content. HOW MUCH TRAFFIC AND WHAT KEYWORDS ARE ATTRACTING VISITORS TO YOUR WEB SITE? Save Time... Stop Chasing low traffic yield keywords. Target the keywords that deliver your target audience! Manage your website content as you would your high street business. We can provide in depth statistics on traffic and visitation to your website. This can be embedded in your web site very quickly and give you a wealth of information. - ENQUIRE TODAY!